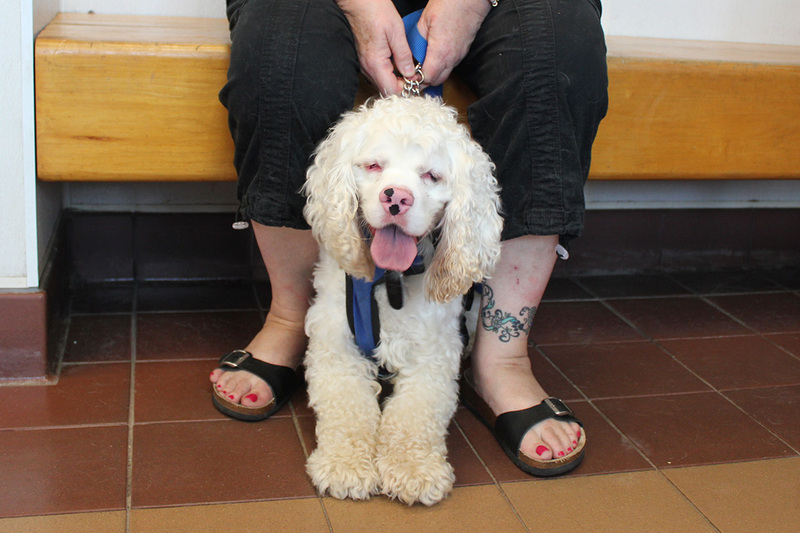 Jamie's Journey, blind, deaf, double merle, cocker spaniel – Jamie has a story to tell. It is a story about a disabled dog that endured hardships to find a forever home and a Mama that loves him. This site is about Jamie and the book I wrote about him. A video done by the Dodo two years ago. Mid summer I did a radio show talking about Jamie and rescue. The every kind, Marilyn Milano, rebroadcast it on New Years Day. Jamie’s trainer did a podcast. The very knowledgeable, David Kurlander, did a podcast that included Jamie’s story. Please listen as he has information in it that anyone can use training any dog. For David, the cup is half full. The shelter Jamie is from, North Shore Animal League, on Long Island, NY recently used his picture as a fundraising campaign. Every dog, cat, puppy and kitten that has ever been rescued and eventually adopted from our Port Washington, N.Y. Adoption Center has a unique story to tell. Since opening our doors 74 years ago, we’ve saved the lives of more than 1 million homeless animals, many of whom have inspiring tales of resiliency, courage, and overcoming adversity. But some stories, like that of Jamie, a Cocker Spaniel puppy rescued from a Midwestern commercial breeding facility with multiple disabilities, whose photo on one of our social media platforms placed him in the arms of his perfect human companion, simply stand alone as one of our proudest success stories. Formerly named Stanley, Jamie was born with the double merle gene – a disorder caused by poor breeding practices often resulting in deafness, blindness, or in some cases, both because of lack of pigmentation. 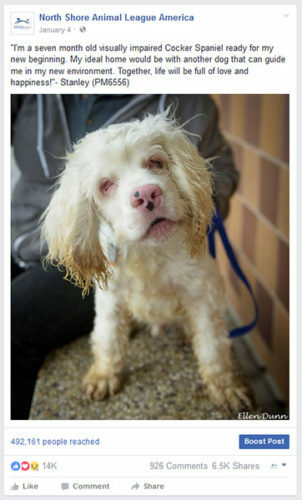 Unfortunately, Jamie was born deaf and blind, deeming him useless to the breeders of the puppy mill at just six months old. Luckily, he was surrendered to North Shore Animal League America’s Rescue Team and transported back to the safety of our no-kill campus aboard one of our Mobile Rescue Units. From that day forward, this handsome creature was afforded with nothing but the best resources our organization has to offer – from high quality veterinary care, to a shelter staff that treated him like a member of their own family – preparing him for the day he would meet the perfect adopter. Jamie was adopted from North Shore Animal League America by Brenda Maeder on January 9, 2017. After continuously seeing his image on her Facebook feed, the Hyde Park resident decided that if anyone was going to provide this resilient dog with the pampered life he so desperately deserved, it was going to be her. 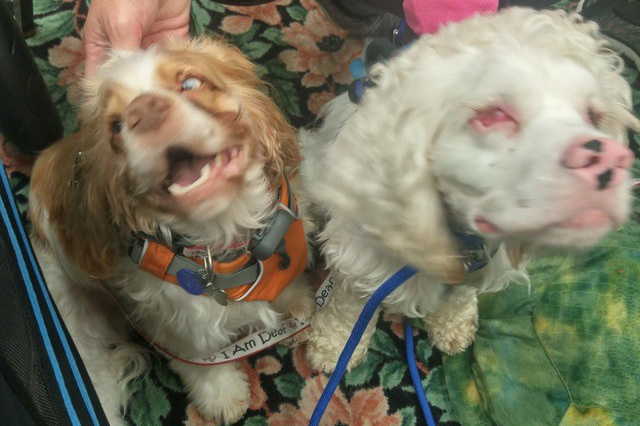 As a longtime rescuer of Spaniels with disabilities and other life-threatening health issues – 28 and counting to be exact – Brenda was confident that she could not only care for the disabled pup, but just as she’s done with her four other current dogs, help him to overcome the odds and thrive as a four-legged member of the family. More than a year and a half later, we are thrilled to report that Jamie is doing just that! When he’s not cuddled in his mother’s arms or rolling over onto his back asking for belly rubs, Jamie is either noshing on his favorite snacks, which often include watermelon and cucumbers, or playing with one of his many toys. Brenda says one of Jamie’s favorite days of the month is when the BarkBox arrives because he knows he’s in store for a brand new treat. Not only does Brenda do all she can to show Jamie how much he means to her every day, but she decided to share his inspirational story with world in the form of a children’s book. Titled “Jamie’s Journey,” the book tells the story about the resilient Cocker Spaniel’s path to becoming the best possible version of himself through training, love and affection, and of course, help from all of the pals, both human and canine, he’s met along the way. Thanks to the support of our generous donors, Animal League America is able to rescue thousands of homeless, sick, and injured animals each year and provide them with a chance to live healthy, fulfilling lives with families who adore them. If not for that constant support, Jamie’s inspiring story, and so many more like it, would never be possible. Thank you for joining us in being the heroes that these innocent animals need during their darkest days. This is how Jamie learned to get down. From his book Jamie’s Journey, on Amazon. We all have our challenges. To a blind and deaf dog climbing up is the easy part. Figuring how to get down the hard part. Jamie being still a pup when I brought him home was very inquisitive. He would climb up on the sofa or chair and then cry for me to come and take him down. For Jamie, they were his Mt. Kilimanjaro or Mt. Everest. Once he conquered getting up and down, they no longer have an interest to him. Tomorrow, how I taught him to climb down.